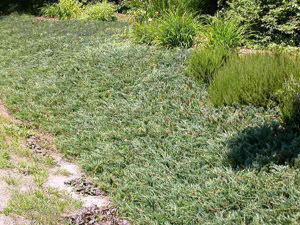 The Blue Rug Juniper is one of the most popular completely flat junipers for groundcover, and is truly a 'Rug' of a plant. It is easy to grow with good disease resistance. 'Blue Rug' has a bluish, generally well-furnished form, mauve-tinted in winter. However, if you are seeking a weed-suppressing conifer then this is probably not the best to go for as its flat form is not usually quite thick enough for this purpose. This factor can be improved by trimming the trailing shoots. The Blue Rug juniper has smooth, adult-type foliage of a blue-silver colour. It is usually dense and well-furnished. The growth rate is fairly quick, a plant making up to 6 feet (2 metres) across in ten years in good growing conditions, and very much less in height.